Home » Take that Sudoku! 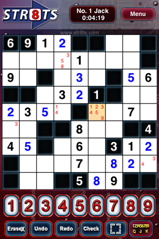 Straight from the developers behind 1 to 25 came a new way of looking at Sudoku. Str8ts, developed for your iPhone and iPod Touch, is the next generation of puzzle games that would truly compete with Sudoku not only for market share, but for providing you with the most original and creative puzzles in a simple yet effective manner. The puzzle is easy to learn, with simple rules and great replay value to give you the right dose of addiction. 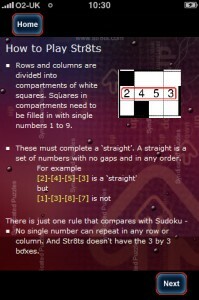 Mind you though, Str8ts is not your average number puzzle game you'd find loads of in any newspaper. With Str8ts you're starring creativity in the face. 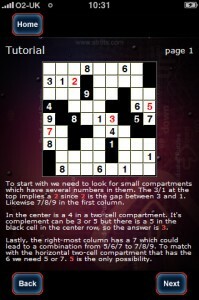 The game has the look of a crossword puzzle, with white and black cells spread on the board at seemingly random places. It does however have rules similar to Sudoku, and it is indeed played with numbers. What you need to do is complete straights in rows and columns, in any order that fits right, by paying attention to the black cells. The iPhone version also gives you a neat tutorial that will get you up and running in no time at all. Str8ts features an astounding 751 different puzzles divided into fours difficulty levels ranging from Jack (the easiest) to Queen (the hardest). Entering in numbers is pretty straight forward. You are also given the possibility to check and see if what you entered so far is correct. Simply press the check button and the incorrect numbers will be highlighted in red. This is a great feature for beginners and rookies, but will do you much good on higher difficulty levels as well. The game doesn't have a lite version yet, although the developers promise it to come out soon. What you do have available is the online version of the game you can try out in your web browser. If you get a kick out of it, be sure to get the iPhone version for the full fun of all the 751 puzzles. The game is available in the App Store for $2.99. Str8ts is a logic puzzle game without all the bells and whistles you'd find in other such games in the App Store. It's meant to be played with a pen and a paper and this is what the developers wanted to see through. The game's simplicity in design coupled with a seamless game play that's easy to get used to make Str8ts one top notch puzzle game. For Sudoku fans, getting used to the new rules might be a bit awkward, for gamers looking at their first number cruncher, get ready for one heck of a treat. The game has enough depth to make up for the simpler graphics and provide you with enough entertainment throughout all its levels and difficulties. What do you think of Str8ts ? Scroll down for our comment section and let us know!